The 3 mile wide lake, which is nearly circular, is the star attraction of the Lough Key Forest Park. Writers have chronicled the history of Lough Key for nearly 1000 years, starting with the year 1041 in the Annals of Lough Key. The Annals were compiled on Castle Island, one of 33 islands in the lake, and are now preserved in Trinity College, Dublin, whereas the Annals of Boyle were compiled on nearby Trinity Island. Both tell of countless battles fought around the lake’s shores and on its islands, as powerful local chieftains, such as the MacDermotts, fought off attackers. The islands also became famous for the monasteries that were established on them. Trinity Abbey, on Trinity Island, is the only surviving Irish example of a monastery of White Canons, an order founded in France by St Norbert during the 12th century. On Church Island are a gable and church door- way of a 9th-century Celtic monastery. The legend of the ill-fated lovers Una Bhan MacDermot and Thomas Laidir McCostello figures strongly in the lough’s folklore. Although from rival families, the two fell deeply in love. Una’s father was enraged and confined her to Castle Island where she became ill and died. Heartbroken, McCostello swam out to Trinity Island every night to visit her grave until, weakened by the cold waters, he fell ill with pneumonia. On his deathbed he pleaded with Una’s father to be buried alongside his loved one. So they were reunited in death and, the story goes, two rose trees grew over their grave and became entwined in a lovers’ knot. The bushes can still be seen. The poet W.B. Yeats (1865- 1939) became so enchanted with the castle on Castle Island that he planned a place there ‘where a mystical order would retire for a while for contemplation’. The idea came to nothing. The 800 acre Forest Park, most of which was the Rockingham Estate, was owned by Sir John King and his successors until 1957, when it was sold to the Irish Land Commission. Rockingham House, designed by Nash in the early 1800s, was completely gutted by fire in 1957, though some of the outbuildings still stand, such as the ice house, or food store, and the temple, with views of the lough and its islands. The park also includes a large area of Woodland, gardens, nature Walks, archaeological remains such as the Carrowkeel court cairn, ring-forts and underground chambers, or souterrains, and the shell of a former estate chapel. A modern structure, the Moylurg Tower, offers fine views of the estate and the surrounding countryside from its top deck. 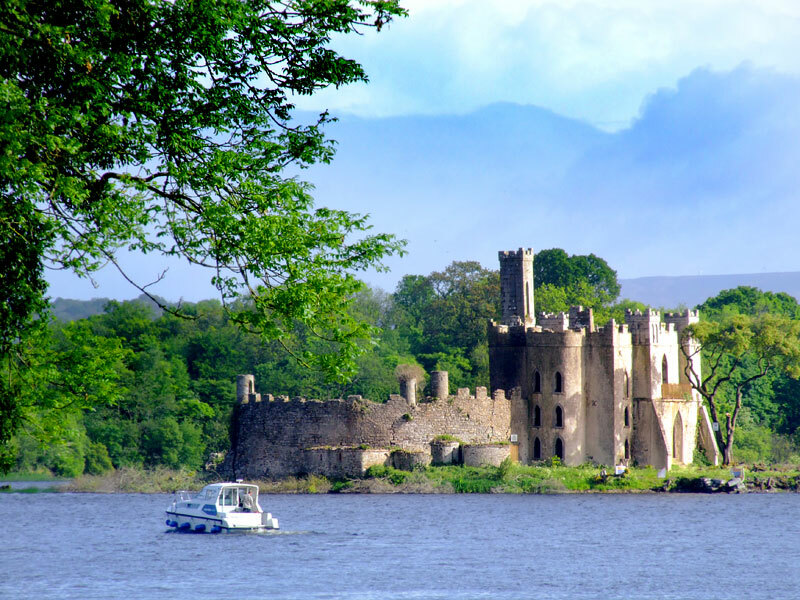 Lough Key Forest Park is a real hidden gem and worth a stop on your Ireland tours.